Katherine’s second book is “Marketing that Drives Revenue” which helps professionals, entrepreneurs & leaders increase revenue. A great resource for students and professionals looking to increase revenue and understand marketing and how to create successful marketing campaigns in today’s society. Marketing is expansive and sometimes can be overwhelming, this book makes it simple. 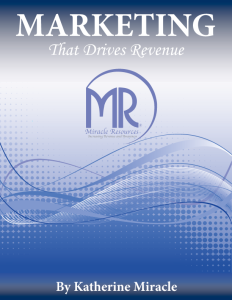 The book includes success spotlights and helps people use best practices to increase revenue through marketing. Please say the name of the consultant that helped you find Miracle Resources.